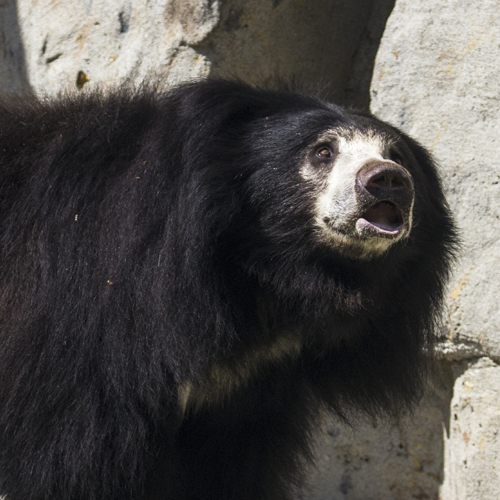 Unlike other bears, Sloth Bears are lanky and have long, shaggy coats. The hair, which has little or no undercoat, is longer around the neck, forming a mane. The round ears are fringed with hair, giving them a large and floppy look. The claws are long and sickle-shaped on strong toes. The muzzle looks too long for the face, but accommodates the long tongue and the specially adapted palate and lower lip. The center, upper incisors are missing. The tail is quite long, for a bear, and (like all bears) Sloth Bears are plantigrade, with bare soles. Sexual dimorphism is only size. Sloth Bears were once found across much of India, Sri Lanka, Pakistan and southern Nepal. They have been eliminated from large areas by human activity, including hunting. As a population, the Sloth Bears on Sri Lanka are obviously smaller and are considered a subspecies. Sloth Bears are found in monsoon and dry forests, as well as some grasslands where there are boulder piles, brush and some trees for shelter. Wild – Sloth Bears are insectivorous, specializing in termites. They also take other insects and fruits, favorites being mangoes, figs, ebony fruits and jack-fruit. They particularly like honey and the comb. Zoo – The Sloth Bears are given insects like mealworms, and crickets, as well as such fruits as pears, melons, oranges, and grapes. Sloth Bears are shiny black, with a large cream to white ‘V’ on the chest (often absent in Sri Lankan bears). Their claws are bone-color. The muzzle is usually yellowish-white to the eyes, sometimes including the eye-lids. The nose-pad is dark. The bare foot-soles are brown, as are the eyes. Brown to rust-color coats do occur occasionally. The Sloth Bear is the most nocturnal of all bears. It is solitary (like all bears), but one source said that a female is much more tolerant of a male than most bears. Generally a Sloth Bear goes about its business in a slow and easy manner. It may appear slow and clumsy, because of the way it shuffles, but the Sloth Bear can easily climb even smooth-barked trees, and is quite agile if on the move. It can and does occasionally hang upside down in a tree, while getting food, which may have added to their miss-identification early on. It will not climb a tree to escape a predator – leopards can climb. They do, however, rest in trees, often making day-beds out of broken branches. The Sloth Bear is one of the most aggressively confrontational of bears, standing up to tigers and leopards and humans if it feels threatened. Tigers will eat Sloth Bears, but will often back down if the bear becomes aware of them before the attack is begun. The Sloth Bear’s claws can deliver serious wounds. The bold chest ‘V’ on Sun Bears and Asian Black Bears as well as Sloth Bears is thought to be a threat-display mark of warning, since all 3 are sympatric with tigers. Sloth Bear fossil-remains have been found in Pleistocene deposits. This is the prehistoric time of bear specialization and dispersal. During this time, in a process called convergent evolution, Sloth Bears developed the specialized characteristics for eating termites. The elongate palate, muzzle and tongue aid in harvesting the termites (and ants), but the ability to close their nostrils, the absence of two center incisors, and their ability to form a vacuum nozzle with their lips is key. They rip the termite mounds open with powerful arms and very strong claws. They blow away dust and then noisily slurp termites out of their nest. Because they eat insects and very little tough vegetation, their premolars and molars tend to be small, and they tend to wear down early because of the amount of grit taken in with the termites. Sloth Bears have a superior sense of smell and can detect grubs 3 feet underground and bee hives in the tops of trees. Despite the temperate climate in which they live, the Sloth Bear coat looks too thick. There is, however, very little undercoat, so the shag is not so much for warmth as it might be to shed water and to prevent stings from bees whose hives they often raid. They regularly climb trees to knock down hives. They indulge in the hive contents (honey and honey-makers alike) when on the ground, and this fondness for honey has given them the nickname of Honey Bear. Sloth Bears are quite vocal when they breed, in early summer. After 7 months gestation, the sow gives birth in early winter, usually in an under-ground den. The 2 (sometimes 3) altricial cubs open their eyes after 4 weeks and stay in the den for a couple of months. When feeding cubs, sows are reported to regurgitate a mixture of partially digested fruit and pieces of honeycomb, a substance that hardens into a sticky, bread-like mass. This ‘bear’s bread’ is considered a delicacy by some of India’s natives. When the cubs do venture out, they often ride on mom’s back, an unusual behavior for bears. The cubs squabble over riding position and may even cling to her long hair while she climbs trees. The cubs are indepen-dent in about 24 months and are of breeding age by 3 years. Captive longevity is to 40 years. Lifespan Estimated to be 20 to 30 years in the wild. Height Height is 3 to 4 feet high. Length Length is 5 to 6 feet long. Diet Sloth Bears are insectivorous, specializing in termites. They also take other insects and fruits, favorites being mangoes, figs, ebony fruits and jack-fruit. They particularly like honey and the comb. The Sloth Bear is listed Schedule I of the Indian Wildlife Protection Act, 1972, providing for legal protection of Sloth Bears. There is conflict between people and bears, mostly based on deteriorating habitat and, therefore, crop-raiding. To resolve this conflict, people, especially locals, must be educated about conservation ethics. Improvements through government and community-based reforestation programs have been promoted. It has been noted that populations of Sloth Bears grow in high-profile reserves that protect species like tigers and elephants. It is important to get the local people to support these directly-managed reserves, since the reserves protect many other species as well and, in the long run, the people benefit. Sloth bears do not hibernate due to their warmer climates and the availability of food sources throughout the year.